The Department of Jobs, Enterprise and Employment has published the Code of Practice Governing Conduct of Adjudication under the recently commenced Construction Contracts Act, 2013 (CCA). The Code of Practice largely fleshes out the provisions already contained in the CCA but it does contain some interesting provisions which further underline the overarching aims of the legislation, i.e. to reduce the time and costs associated with prosecuting a payment claim in a construction contract and fairness to subcontractors. The Code sets out the responsibilities and powers of an adjudicator in respect of a payment dispute. It contains a specific direction that a prospective adjudicator should only take on a dispute if they (i) are able to devote the time and attention to the dispute that the parties are entitled to expect, (ii) has the competency to determine the issues; and (iii) is satisfied that no conflict of interest exists. In respect of conflicts of interest, the Code provides that should any potential conflict arise, either before the commencement or during the course of the adjudication. the adjudicator may continue to act provided both parties consent and any professional or ethical concerns the adjudicator themselves have are satisfied. The Code specifically prohibits any adjudicator contacting any party to a payment dispute with a view to soliciting an appointment. As regards the conduct of the adjudication itself, the adjudicator has a specific duty to be impartial and independent and abide by the principles of procedural fairness. The Code further directs that the adjudicator shall set out the procedures they intend to apply during the adjudication process at the outset, which procedures must include a timetable for the adjudication and any deadlines to be complied with by the parties. These procedures may be revised during the course of the adjudication as appropriate. Importantly, the adjudicator has a specific duty to draw the parties' attention to paragraph 35 of the Code of Practice, which provides that if a party, "without sufficient cause", fails to (i) attend a meeting, (ii) comply with any direction of the adjudicator, (iii) disclose any information which may give rise to a conflict of interest, or (iv) produce any document or written statement requested by the adjudicator, the adjudicator may: (i) continue the adjudication in the absence of the party, (ii) continue the adjudication without the document or written statement; (iii) draw such inferences from the failure to comply as may be justified in the opinion of the adjudicator; (iv) make a determination based on material properly provided only; and/or (v) make a determination on costs of the adjudicator as appropriate. The theme of keeping the costs of the process down is prevalent throughout the Code. The Code specifically states that the adjudicator must ensure that the procedure adopted is "commensurate with the nature and value of the payment dispute". There is a specific duty on the adjudicator to use reasonable endeavours to process the dispute in the shortest time and at the lowest cost. Finally, the Code provides that the adjudicator's own costs and expenses shall be reasonable having regard to the amount in dispute, the complexity of the dispute and the time spent by the adjudicator. The above provisions emphasis the Government's vision of adjudication as a quick, low cost resolution process. Adjudicators won't be thanked for holding week long oral hearings in a low value dispute. That is not to say that such tactics will not be attempted by employers and contractors trying to blow the other side out of the water. It is up to the adjudicators to manage the process and ensure such devices do not succeed. 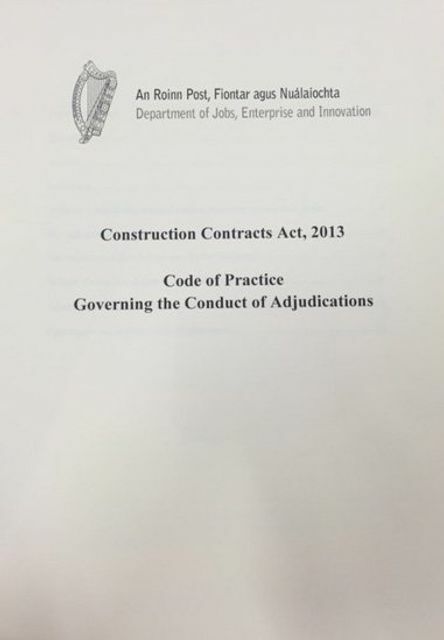 The Code of Practice on the Conduct of Adjudications has been published in accordance with section 9 of the Construction Contracts Act, 2013 by the Minister of State for Employment and Small Business, Mr Pat Breen TD.